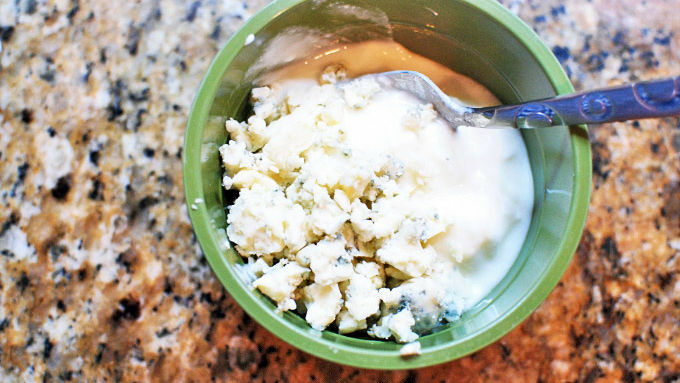 Mix the yogurt with the blue cheese and let it sit a few hours or overnight. Mix the wing sauce ingredients and microwave until very hot. 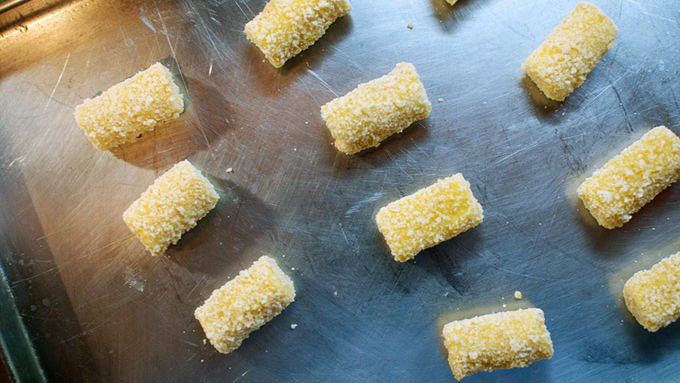 Cut each cheese stick into 3 equal nugget-sized pieces. Put the flour and breadcrumbs onto plates. Whisk the eggs and put them onto a third plate. One by one, coat the cheese in the flour, then the eggs, then back to the flour, then egg again, and then finally the breadcrumbs. Really press the breadcrumbs onto the cheese. Repeat the process until all the pieces of cheese are coated. Fry the cheese in 2 batches in 350° F oil until browned on all sides. Remove from oil. 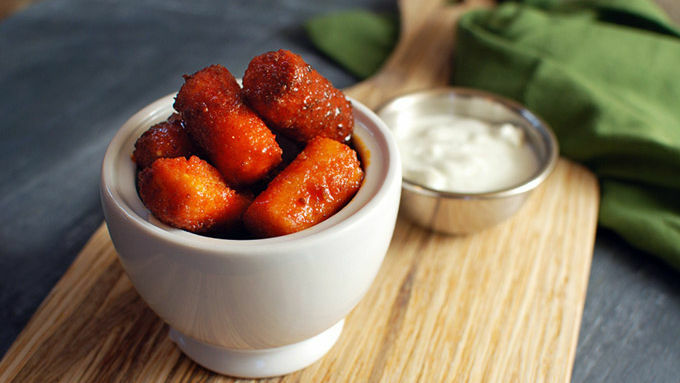 Toss the cheese sticks into the buffalo sauce. Serve with the yogurt sauce. These bite-sized sticks are spicy, tangy and super cheesy. 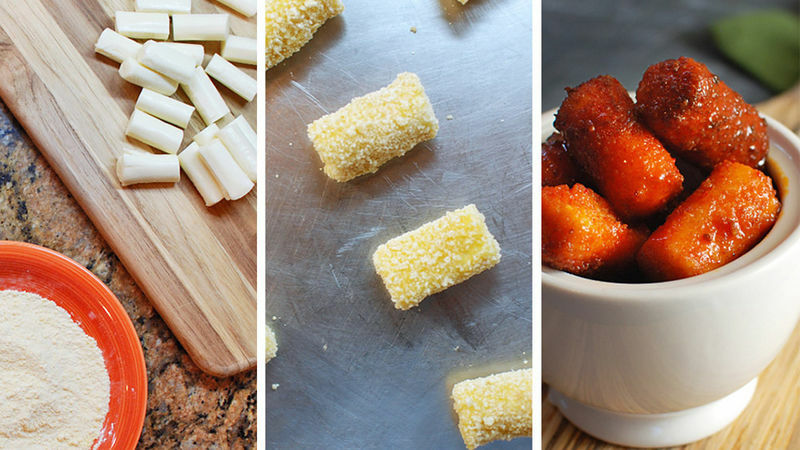 Mozzarella sticks are one of the most well-known snacks around, but you never really see any variations on them. This new twist tosses the freshly fried cheese into a spicy and tart buffalo sauce, just like what you would do with chicken wings! This was a great new take on the classic bar snack. The spicy sharp sauce went great with the creamy cheese and crunchy breading. And of course, there's nothing better than dipping cheese into cheese, so I made a quick sauce with yogurt and blue cheese. Make this early so it can sit for a few hours and the flavors can really come together. My friends and I had no problem demolishing these in a matter of minutes.